Well, we've developed a new recipe from something that we sampled at Sams again. Funny huh! It does feel like we are helping to support the local community somehow. Arkansas is the home of Wal - Mart originator Sam Walton. Apparently his family members are also some of the wealthiest on some list, like Forbes or something. I also read recently that Wal - Mart Supercenters will be providing more localy farmed produce in their stores, so I love that. The kids love the samples at Sams. I got some bread out - he wanted sour dough, but what we had at the time was a rustic Tuscan style loaf - anything works really! I spread it with Boars Head Delicatessen Style Mustard with White Wine. It's just what we keep, and the kids.......well, Gianna likes it. So that makes three of us in the family in agreement anyway. I sauteed some sliced green bell pepper and onions for quite a while over medium heat. 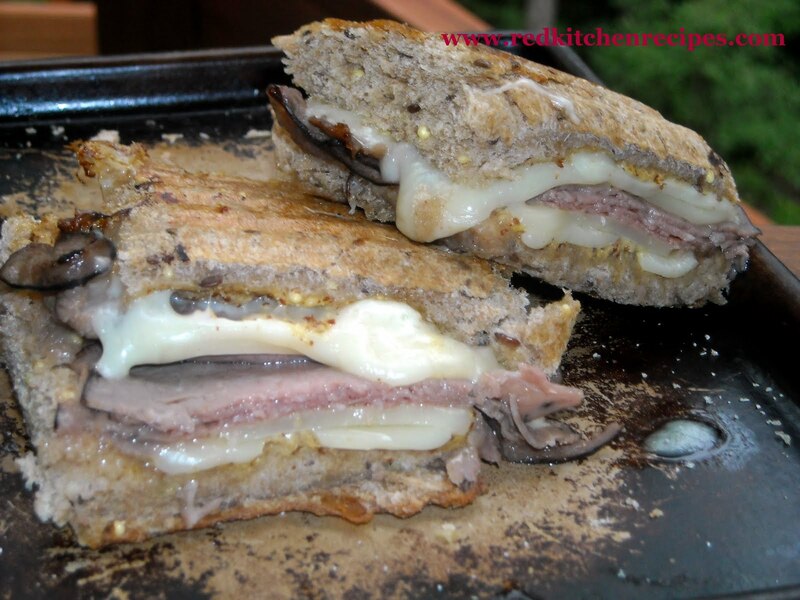 Then I topped the bread slices with the prime rib beef and swiss cheese. I warmed it up in the oven at 400 degrees until the cheese was melted, then I removed the top and layered some of the sauteed green peppers and onions on it. 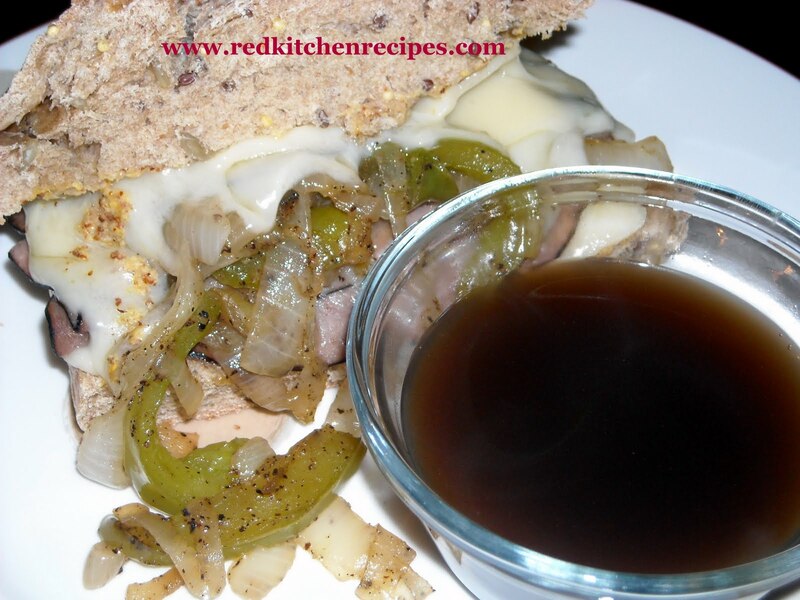 I also had some au jus that I made with a seasoning packet from the grocery. Next, I had to make a panini out of a sandwich for Gianna. The girls and I were once invited to the Country Club of Little Rock to go swimming with our friends the Pennebakers. Lunch time there was where she had her first ever panini. She told me that from now on, that's how she wanted her sandwiches. She must have been 6 years old. But she was not playing around. Anytime I don't get the bread just right, and crispy on the outside, and pressed really thinly, she will not eat it. So her panini didn't have the peppers & onions, since many kids don't like those things. It's almost the only reminder that she is a kid, though. Sometimes we wonder how she seems so mature for her age. I used a cast iron pan to press this panini, btw. Just sprayed the pan with some canola spray, and pressed both sides - careful not to let anything slip out - then waited for the cheese to melt. You can also use a bacon press if you have one. 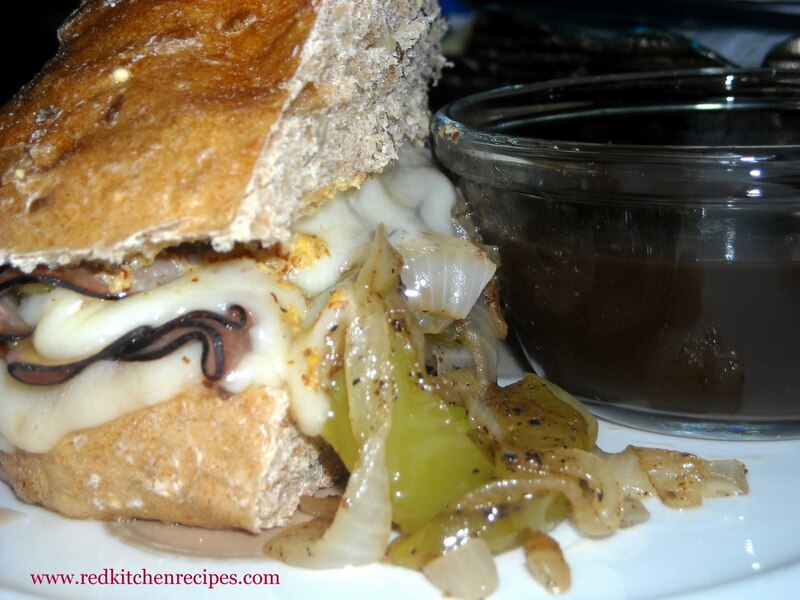 When you dip the sandwich in the au jus and take a bite, it is so yummy.